A private society in one of the provinces of the Netherlands, in 1825, first distributed medals for deeds of self-devotion. The Belgian government introduced the same into Belgium after the revolution. The expenses are included in the annual budgets. 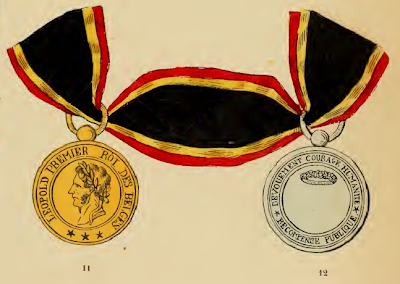 The medal is distributed in gold, silver gilt, and silver. The intrinsic value is 100, 50 to 60, and 30 to 40 francs. It is worn at the button hole by a tri-coloured ribbon, black, red and yellow. The front of the medal (Nos. 11 and 12) represents the effigy of the King, with the inscription, "Leopold Premier, Roi des Belges". The reverse shows in the middle a crown, beneath which is, each time when presented, engraved, the name, domicile, and the cause of the reward, of the recipient. The legend is "Devouement, Courage, Humanite - Recompense publique" (Self-devotion, courage, humanity public reward). 1. The medal is in future to be adorned with a crown. 2. The distribution of the colours of the ribbon by which the medal is worn suspended at the button-hole is shown (Nos. 14, 15 and 16).